Artists in live shows and recordings are professionals who need the best equipment possible for purposes of recording their work, and a shoddy microphone is the last thing they need on the set. If you are on a budget, the microphone is the first piece of equipment that should be secured with quality and performance in mind. 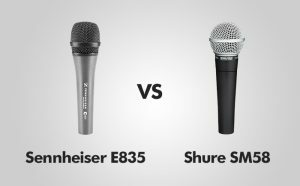 In this comparison, I will compare two of the most popular microphones doing the rounds in the recording world, namely the Sennheiser e835 and the Shure SM58. The Sennheiser E835 is built in Germany and the Shure SM58 is made in Mexico. Both the products are available for sale in the USA and beyond, so your choices are open. When I compare these two excellent microphones, I will be taking into account important factors like design, durability, the versatility of the two, and of course the sound quality. The design of a microphone is not usually a very big factor in choosing it over other microphones, because the pertinent issue with selection is quality of conversion of sound waves into audio signals. But even then, you would not want your swanky recording studio to host large and ugly looking microphones, would you? The design of the Sennheiser e835 oozes strength and durability. Being a dynamic microphone, it is ideal for live performances and sports an internal coil that compensated for hum, keeping handling noise is kept to a minimum. This dynamic microphone sports an all-metal look and has a cardioid polar pattern. In dimensions, the Sennheiser e835 is 180 mm x 48 mm, and is narrower and longer than Shure SM58. Sporting a steel mesh grille and legendary rugged construction, the Shure SM58 is the stuff of legends. Many tests have been performed to test the durability of this indestructible 162 mm X 51mm cardioid polar microphone, and they conclusively agree that it is a very hard nut to crack, literally, and it scores over the Sennheiser e835 in durability tests. The shock –mount system is pneumatic, and it nixes noise very capably. There is a spherical pop filtration system built in and the 180-degree stand adapter is both resistant to breakage and rotatable at the same time. Mounting the Shure SM58 is a peach compared to the Sennheiser e835. It is also a tad bit heavier, adding to the sturdiness. The e835 boasts of presence boost, the midrange is kind of flat and there is observable roll off in the low frequencies. The presence boost system in the e835 is better than the SM58, being much exaggerated and extending further, a bonus for the performer. But this may pose a problem to instruments like high-gain guitars, and you need to find the sweet spot. The extended roll-off feature for the low frequencies is very useful for applications like an amplifier for a bass guitar, deep voice and also a kick drum. The fact that the SM58 has stood the test of time speaks volumes for its stellar performance and wide versatility. It can handle a great number of sources quite easily. You will find a slight bump near the top end frequencies, but the midrange is more than level. The roll off begins at around 100Hz for this iconic microphone. The specs may say that frequency response is starting from 50Hz, the truth is tha7t it does so from 100 HZ only. The Sennheiser e835 scores over the SM58 in this aspect. But it is to be remembered that both the microphones have specific advantages with various range of frequencies, and it is good if you have both in your kitty if you can afford to. There is a reason why the SM58 has survived and thrived for so long, and it really is a piece you should have if you are a vocal or instrumental performer, doing gigs over the country and beyond. Because of presence boost, you will find the e835 airy, and the openness stands out. Fuller and definitive lower range sounds mean that the overall and all-round sounds make for a pleasant session of recording and playback. However, you must know that the e835 cannot handle EQ very well and the recording may sound like a package instead of a blank canvas where the input sounds could have created layers. Many applications exist where you will need this kind of output sound, and you should be clear about your expectations when going to the e835. Keep in mind that the enhanced presence boost technology can make some sound sources feel harsh to the ear. Low frequencies are less faithfully reproduced on the SM58, but the microphone scores over the e835 in incorporating faithful reproduction of EQ. A wide variety of different pitches and scales are represented, which is a boon for any vocal performer. All in all, if you know how to tweak the settings on the SM58, you can have a rich recording experience. There are sufficient printed instructions on how to go about that as well when you purchase the microphone. Except for the low-frequency rollback issue, the SM58 is good to go. It is quite difficult to choose a clear winner in this particular category because of the different advantages they offer. If you really have to choose one over the other, go with the SM58 because of the tweaking options available for the EQ if not anything else. PROS: The high presence and clear reproduction / Can tackle high sound pressure / Isolation of handling noise / Hum compensation / Feedback rejection is very good / Comes in a rugged metal housing / Low-frequency sounds can be reproduced. PROS: Very strong and sturdy / Capable of handling EQ amazingly well / A true sidekick to a person who knows how to use it. CONS: Bigger than the competitive SM58 / Sounds too clean / Cannot handle EQ well / Not as durable as the SM58. CONS: Low-frequency range is not faithfully reproduced / A minuscule lacking in the tonal quality at high ranges. There are many microphones vying for your attention in the below $100 segment. And when it comes to the Sennheiser e835 and the Shure SM58, it boils down to who is actually using it. If it is the average user with not much experience in recording, I would recommend the Sennheiser e835 for its faithful reproduction. But for professionals who know what they are doing, the Shure SM85 is the microphone to go for.